Beautify your building perimeter, walkways, lobby areas and any other area where smoking material needs to be extinguished. 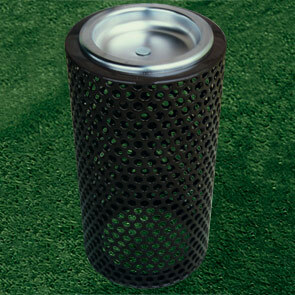 The 11" x 24" tall outside ashtray is made with thermoplastic coated perforated steel for all weather durability and comes with a chrome tray. Base is finished with a lightly textured matte Polyethylene coat, and optional mounting kits can be galvanized for a muted gray appearance or powder-coated in your choice of color options shown below.